3 Better Uses for Digg 3 Better Uses for Digg – MillionClues! Digg is almost binary; 1, when you hit the homepage and zillions of visitors roar in and 0, when you stay hidden with close to zero traffic. Once I tried to crack into Digg, but gave up the plan after a discussion with @ManiKarthik for the following reasons. Traffic from Digg is not sustainable, they come in only when your page is on the homepage. Due to the hike in traffic, there is every possibility that your server goes down. Its so embarrassing to see the doors closed when guests arrive for the party. Two or three thumb downs and the party runs out of beer. The time and effort spend to come to the homepage (unless its natural) has to be repeated every time. Your Digg account can get suspended very easily even if you play it safe. I got chucked out recently, I hadn’t dugg for months, and one day when I log-in, bam, its gone. Just like that. But I have come to find Digg very useful for other things. Here are they. Next time you search for a software in general, do it on the Digg search box. From the results page, proceed to the post that has the maximum diggs. You will find what you were looking for. It works! Google can be very tricky at times, especially when webmasters manipulate pages to get better search rankings. But nothing can beat the people’s votes a page gets on Digg. 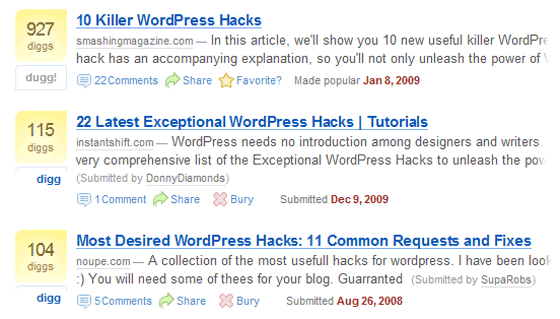 Once you have an article in mind, go over to Digg and do a search with the main keywords. Filter the results as “Most Dugg”. Look for articles that have huge number of Diggs (the sidebar gives options to filter this), those titles are usually the best. Adapt from them. The page title has become so important these days, especially on the social media. On Twitter, once you are in track with a good follower-ship, others would re-tweet your post if it comes with an attractive and interesting title. If you have observed Digg homepage, most of the posts come with awesome titles. Check Digg homepage once every day just to see what is hot and trending. If you see articles related to your niche listed there, you should probably check it out, find a different angle to it and blog about it too. What do you use Digg for? 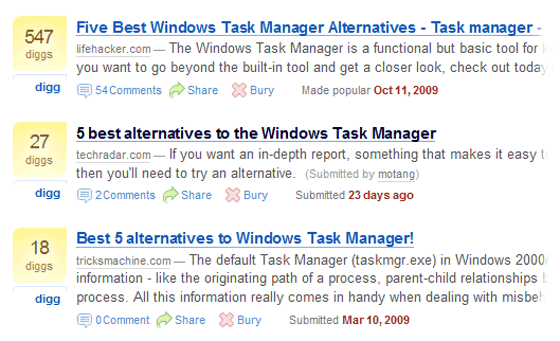 I love your point on using it to rework your titles. This is a great way to see what is working and how people respond to different words. Are people digging any more to share content? Just yesterday I read in TC that sharing through Digg is only 3%. Facebook and Twitter are the top 2 sources to share content. Digg is losing its ground ..
Digg is an old school blog promotion tool and marketing strategy now.. Its high time to evolve towards something more social FB, Twitter and stop wasting time on digg… I’ve seen top bloggers like smahing mag tweeting that stumbleupon brings in more traffic and I kinda agree to that. No one kicks you out from SU (or atleast not so fast as digg). I was kicked and I feel bad, I can imagine how you must have felt when you got your ticket, being a power digger. When one of my posts made into digg fp, it was like heaven for me. And you are right the traffic is not sustainable, but there is one advantage, instant popularity! For me digg is good i am getting good clicks from it , i like it , still digging.